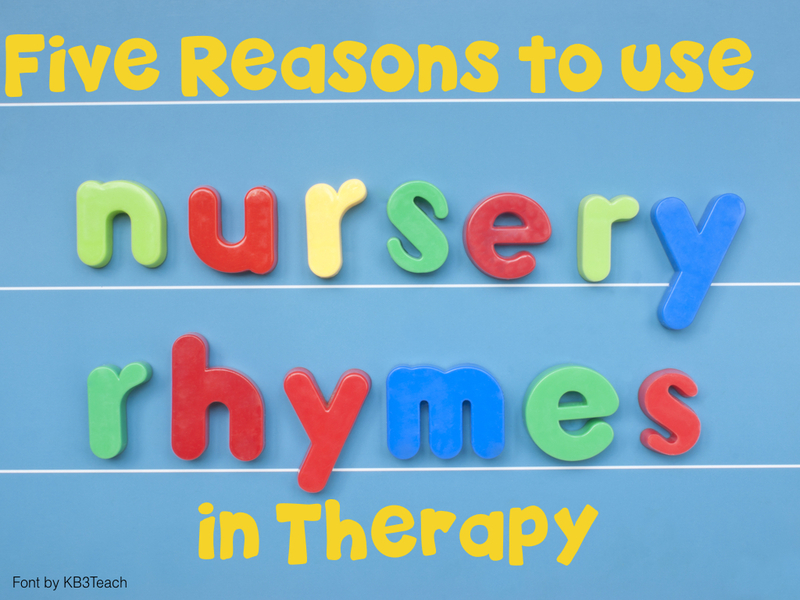 Nursery Rhymes can be a great resource of therapy material for SLPs. Here are five reasons to incorporate them into your therapy. Nursery Rhymes are great for developing literacy skills. I’m always a fan of reading with children. Many nursery rhymes contain many rhyming pairs (e.g. “One, Two, Buckle my Shoe”). Taking the rhyming pairs from the nursery rhyme and using them in other activities allows you to extend the child’s understanding of rhymes. Nursery Rhymes are great for teaching vocabulary. Books that contain nursery rhymes are usually beautifully illustrated. This allows children and adults to talk about the pictures, which is great for increasing sentence and building vocabulary. As well, they are repetitive allowing children to build their understanding of the words and sentences. Nursery Rhymes are typically short. This is a great way to add some literature into therapy for those children with short attention spans. Also you can repeat the rhymes again and again throughout your treatment session. They are great for teaching prepositions. Many nursery rhymes such as “Jack be Nimble” or “Little Miss Muffet” have prepositions in their lyrics. Have children act out the lyrics, which helps them learn the different prepositions. They are great for teaching children how to play. For those children who have difficulties with pretend play, nursery rhymes can provide great scripts to help them start. Therapists can then branch off from the nursery rhyme to extend their play. BONUS: Nursery rhymes are highly engaging and most children love to listen to them.